Official T-shirt of reunion 2004. Click for a larger image of artwork. Our Reunion 2004 was a great success. 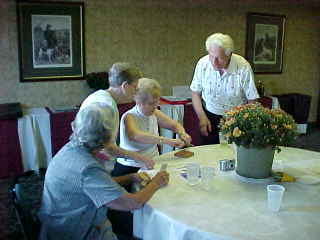 We set up base at the Best Western Maryland Inn in Laurel, MD where we were in close proximity to our nation's capitol. 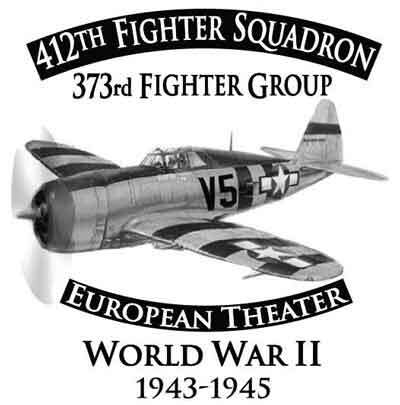 This afforded us the opportunity to visit, as a squadron, the newly dedicated WW II Memorial and our nation's aeronautical museum at Dulles International Airport. See our Fall/Winter 2004 newsletter for details. 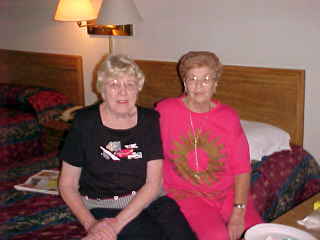 Always present, but most often behind the scenes working diligently to make our stay pleasurable and fun, was our hospitality team of Bea Geise and Olive Sauter. 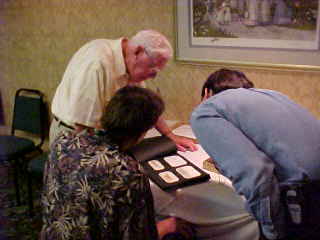 Carroll Wooge reminisces as he reads about the "Jug" while Dennis Hayman and Moe Richardson enjoy PJ's scrapbook album. 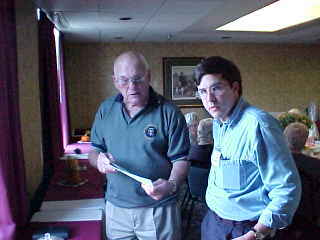 Bob Corey is seen here with David Schwartz, cousin of the 373rd's first CO, Col William H. Schwartz, Jr.
Mastering the puzzles are Wyllo Wooge, Mary DeHart, Frances Harvey, and Joe Ritz. 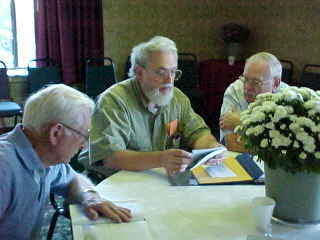 Tom Vesey passes on the history of the 412th to the next generation, Tom Ritz and David Schwartz. 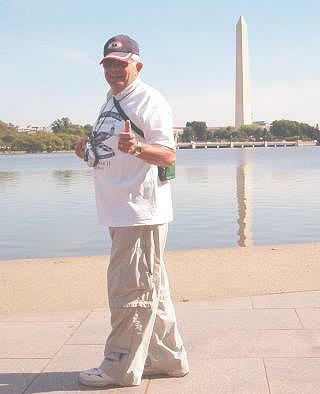 "Thumbs up" by reunion coordinator and shepherd Bob Colangelo, seen here at the Jefferson Monument with the tidal basin and Washington Monument in the distance. No, that's not three peas in a pod but rather Bill and Bea Geise along with Moe Richardson at the FDR Gardens. 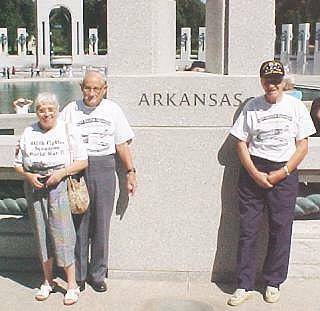 "Razorbacks" Lillian Reeves and Roy Thurman with Joe Ritz at the Arkansas column of the WWII Memorial. 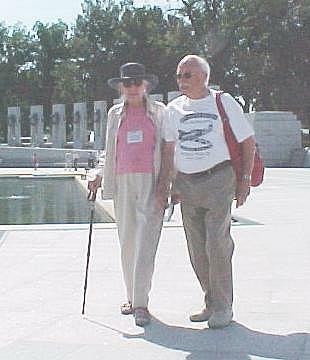 Louise and George Cooper strolling through the WWII Memorial on a delightfully bright September afternoon. Although he moved to Maryland shortly after the war, Joe Ritz was originally from Pennsylvania. Joe stands proudly at the Pennsylvania column along with his son and daughter-in-law Fred and Joyce. Bill Mather at the tidal basin with that wonderfully warm smile of his. Ernie Ritz, Tony Panaro, and Tom Ritz pose in the FDR Gardens. 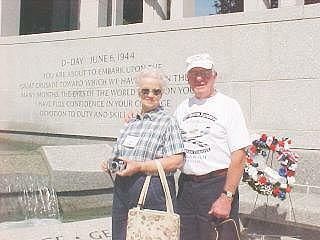 Inez and Gene Ross at the D-Day remembrance wall just under the Atlantic Arch (East arch) of the WWII Memorial. 9th AF image courtesy of Bruce Lowell and Bob Colangelo.